They are at it again. The masked raiders have once again feasted in your trash bin and left a mess for you to clean up. It is difficult to keep these intelligent creatures out of the buffet in your side yard. This is a guide about keeping raccoons out of the trash. How to keep raccoons out of the trash? I have a plastic garbage bin with a twist- off lid. 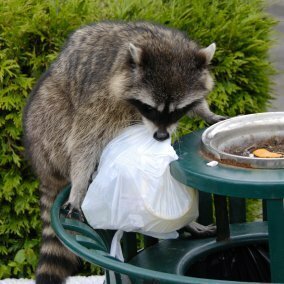 Now, racoons are pretty clever, but I don't think they have the hand-stength to get this kind of lid off! You can buy an inexpensive powdered coyote urine online. Its harmless but repels naturally. We live in Florida and our Community backs onto a conservation area where racoons live. We are principally a vacation renting community and therefore trash cans are placed curb side most days of the week. Racoons patrol for food every night , over turning the trash cans and littering our streets with unhygienic household waste. Our Home Owners Association have found a very simple device for securing the lids of our cans,. It comprises a spring fastener, attached to the can wall by a bolt and nut, and an anchor bolted to the lid. I put my can curb side and now see that the raccoon no longer topple it, but look and walk on by because he knows he cannot get in. We don"t have strewn trash anymore.